Alexandre VAN CAUWENBERGUE gaves us his testimony after his participation to the 7th edition of the Trail du Tour des Fiz. Disabled trailer, Alexandre prouves us one more time that the trail is a sport open to everyone! Well done to you Alexandre and see you next year for the 8th edition of the Trail du Tour des Fiz. My name is Alexandre Van Cauwenberghe, I am deaf and I have a handicap on my left arm following a bike accident when I was 14 years old. I love trail, it’s a difficult sport especially with my handicaps. 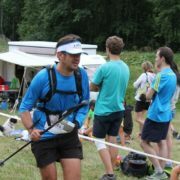 I run the Trail du Tour des Fiz on sunday, the 30km one, I was the number 776. My result was good despite a fall, I run the trail in 5hours and 43 minutes and arrived 182 on 421. It is a very beautiful race with stunning views! I’m happy I run it! Thank you to all the people who were supporting us on the way and to the organisation team! I’ll be back next year for the 8th edition!